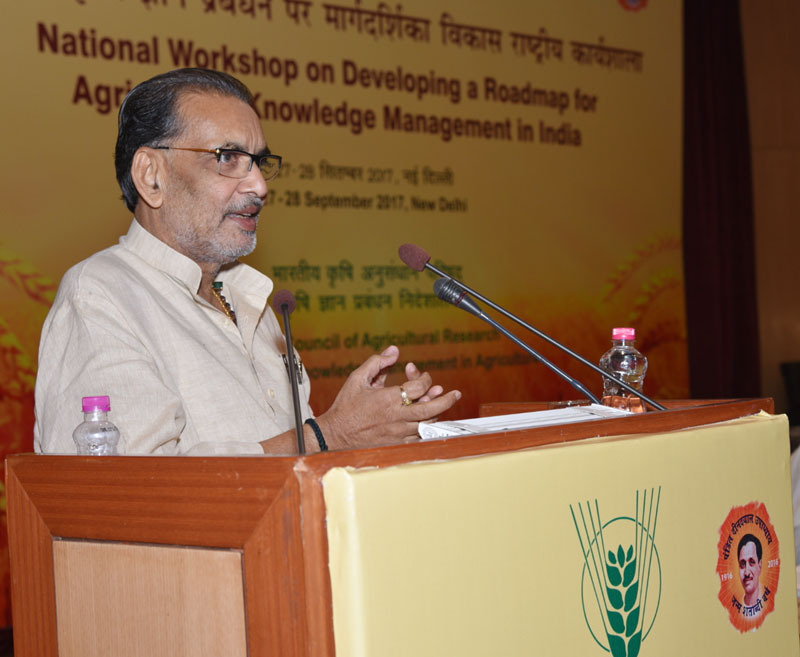 The Union Minister for Agriculture and Farmers Welfare, Shri Radha Mohan Singh addressing at the National Workshop on Developing a Roadmap for Agriculture Knowledge Management in India, in New Delhi on September 28, 2017. New Delhi: Indian Council of Agricultural Research (ICAR) for the first time, a national level workshop has been organized to prepare a roadmap for agricultural knowledge management on September 27-28, 2017. Union Agriculture and Farmers Welfare Minister, Shri Radha Mohan Singh addressed the workshop. More than 300 eminent agricultural scientists and information technology experts from all over the country participated in the workshop. Shri Singh said that 58 percent population of the country still relies on agriculture for livelihood. Irrespective of industrial and services sectors progress, the agriculture sector is still the top employer. He said there is a steady increase in the number of small and marginal farmers in the agrarian sector. Due to traditional farming and low productivity, they are unable to achieve higher yield despite hard work. In the absence of information related to modern and scientific agricultural systems, this situation persists throughout the country. Union Minister informed that a vast network of agricultural research and education thrives in the country under the leadership of ICAR. More than 102 Agricultural Research Institute, 73 Central and State Agricultural Universities and more than 690 Krishi Vigyan Kendras are working under it and researching for the development of agricultural techniques, high-yielding crops and development of livestock and other activities. The network is constantly generating useful information. However, due to ineffective mechanisms to spread information most of the benefits of farmer-oriented research take a long time to reach the agrarian community. Shri Singh said that the government has taken several initiatives in recent times to bring such useful information through the help of modern information technology to the farming community in the shortest possible time. It includes Farmers Portal, Kisan Call Center, Fasal Bima Portal, Rice Export App, Pusa Krishi App, Agro Collect- Krishi Gyan App, e-NAM Portal, etc. The two-day workshop organised by the Directorate of Knowledge Management in Agriculture, ICAR, at Pusa, New Delhi, has been divided into four sessions where Scientists and IT experts exchanged views on topics like current Status of Agricultural Knowledge Management, Data Management and Information Storage for Higher Agricultural Profits, and the Role of Media in Knowledge Management.